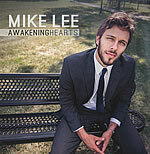 Mike Lee isn’t your typical worship leader. From his experience with mixed martial arts to his resonant gifts, Lee is a young talent to watch. Propelled by a successful Kickstarter campaign, the burgeoning songwriter and worship leader for Liquid Church in Fort Wayne, Ind., recently released his first EP, Awakening Hearts. CCM: I’d love to know a bit of your own musical background. Were your parents musical? Did you start learning to play an instrument early on? MIKE: I definitely come from a musical family. My uncles were involved in gospel quartets back in the ‘60s. My dad was a bit more rebellious. As a teenager he was the front man of a band that played in local bars. He was a 17-zippers-on-his-leather-jacket, crashed-his-motorcycle-on-a-wild-ride kind of guy. He was the one who taught me my first chords when I was 14. Honestly, I started playing music to be like my dad, but I didn’t really learn to play until I encountered the Lord about a year after that when I was 15. I also got into a little piano when I started writing. CCM: Do you remember the first time you ever led worship at a church gathering? MIKE: I did a lot of informal leading almost immediately as soon as I knew enough chords to play a song. I led fairly regularly for a college group at Pathway Community Church when I was 16. There, I was trained by an amazing man named A.J. Joseph, who introduced me to spontaneous worship. It changed my life. Probably the most impactful worship experience I had as a young worship leader was the first time I led at Liquid Church in 2006. This experience shook my understanding of worship because the people sang so whole-heartedly, and they were so in love with Jesus. Their harmony and passion brought me to places of joyful laughing when there were moments I couldn’t sing! That was definitely a first for me. CCM: It’s interesting that you also co-own a gym and work with mixed martial arts. Does that segment of your life influence your music at all? Or vice versa? MIKE: I haven’t really thought about the influence that my coaching has on my music, as both music and mixed martial arts are passions of mine. My fighters know that I sing, and they all have heard me do so a little bit. My band members know that I train fighters, and some of them have come in for a little bit of training. I will say this: it is weirder to punch my guitarist in the head than it is to sing around a fighter. I think both fighting and leading worship have taught me things and influenced me in ways that affect every aspect of my life. They are both part of who God created me to be.